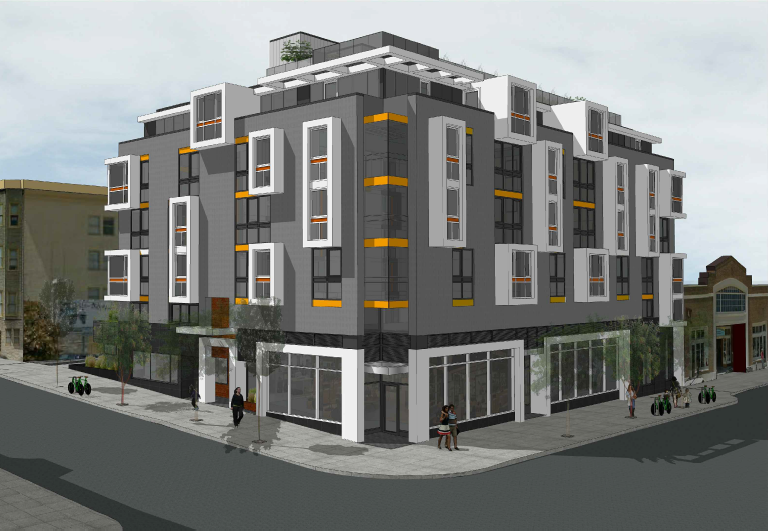 Rendering of 1298 Valencia St., next to Arizmendi Bakery. Courtesy Ian Birchall & Associates. Housing advocates at a Wednesday night meeting objected to a new housing project at the corner of 24th and Valencia streets, saying it would only exacerbate the gentrification on Valencia Street. At minimum, they said, it should have more affordable housing. “They say they are small, only 20–30 units, but these are the negative projects that are affecting the neighborhood,” said Dairo Romero, a community planning manager with the Mission Economic Development Agency who said he was speaking as a Mission District resident. The smaller developments matter, Romero said, and Valencia Street in particular has gone the way of boutique shops and unaffordable rents. Romero was one of just a few activists who attended the small meeting of six people. For the most part, activists focused on the four affordable units in the project — the minimum 12 percent required by city law. The Mission District, they said, needed more equitable housing. Jordan Gwendolyn Davis, a transgender activist and Mission District resident, objected to the addition of “more market-rate housing of very low inclusionary percentages” saying the project would raise rents for others and exacerbate displacement. “I feel like this neighborhood needs more affordable housing given the gentrification,” she said. Cindy Mendoza, a neighbor of the project, also voiced concern about the possibility of a ground-floor restaurant on Wednesday, saying “there’s a lot of restaurants on Valencia Street” already. Valencia Street has undergone a major shift since the 1990s to become the more upscale brother of Mission Street to the east. Restaurants and high-end shops line the corridor, and many commercial tenants — like Modern Times Bookstore and Lost Weekend Video — moved from the corridor to other Mission locations because of unaffordable rents. Others have gone out of business altogether. The change of the commercial corridor is a warning to Mission District activists, who want to shield 24th Street and Mission Street from the same gentrification and displacement of local businesses. Calle 24, a neighborhood association that works closely with merchants, has consistently opposed new market-rate housing in the neighborhood for fear that tenants with higher incomes will favor more expensive shops and eateries, pushing others out. The project at 1298 Valencia St. next to Arizmendi Bakery includes a mix of mostly two and one-bedrooms. Four of the 35 units will be affordable at below-market-rate, and all of the units are condominiums. A ground floor retail space would face Valencia Street, possibly occupied by a restaurant or shop. The project is meant to be “transit-oriented” and includes just eight parking spots. A roof deck, indoor gym, bike racks, and some terracing are currently envisioned, as well as a cobblestone alley behind the building on Poplar Street. The project is being developed by the owner of the property where a gas station now operates. Ian Birchall, the principal architect behind the project, said the project sponsor had not yet chosen a tenant — restaurant or otherwise — for the 2,200 square feet of ground floor retail space, which could be broken up into two or three smaller spaces. Birchall is a local architect headquartered at Erie Street and South Van Ness Avenue responsible for the design of at least two other projects in the Mission District, including a 73-unit project at 19th Street and South Van Ness Avenue and a 23-unit building at 15th and Shotwell currently under construction. On Wednesday, he said he understood “all too well” the concern with rising rents. His commercial rent went up by 30 percent recently, he said, and he was a “part of the community” that was not immune to gentrification. But Birchall avoided engaging in a political discussion with opponents of the project, saying they could correspond with him in writing for issues not related to design. There was little need. After a few comments from Romero and Davis, the meeting was over and attendees trickled out. Near the end of the meeting, however, Mendoza said she would “lose [her] view of the fireworks across the city” if the project went forward. She said she was generally supportive of more housing, but would “love to see more affordable housing” in the Mission District. “We got Ellis Acted from my apartment in Bernal,” Mendoza said. I’ve been on Valencia street since 1981. I bought my property like reasonable people do. So I don’t have to try and put a pox on the neighborhood to keep my cherished rent control…..
Good point. I should have worked harder to the job I have now in 1981, when I was not alive yet, so that I too could have afforded to buy my house before income inequality and the housing bubble created a generational housing crisis and downward mobility for people of my generation. I could have also tried harder in the year of my birth, to be born to a wealthier family to shelter me from the neo-liberal economy. I really blew it!! There are 7 + billion people on the planet…. you are just one of them… The vast majority of them don’t live in San Francisco… are you more entitled than these other 7 billion ? Bob, you are very lucky and one of the few that could afford to buy here, even in 1981. I was born and raised here. I have never been able to afford a home in my home town. Yes, I cherish my rent control, if I didn’t have it I would be living in Sacramento. I have lived in the Mission most of my life and I don’t want it full of luxury condos. Build it! New housing stops displacement. When people who can afford market rate move to the Mission — and they will, whether we build or not — we need to have new buildings they can move into so they aren’t pushing others out. Displacement is the direct result of a totally avoidable housing shortage. YES – BUILD IT!!! Guess what? More housing, fewer evictions! Looks great. The neighborhood needs market rate housing to help stop displacement. Please build it! In the mean time, I can’t tell the difference between the Mission and Legoland. Why was this neighborhood once so cool? I’ve forgotten. Please show me your evidence that building very very few new buildings stops displacement.